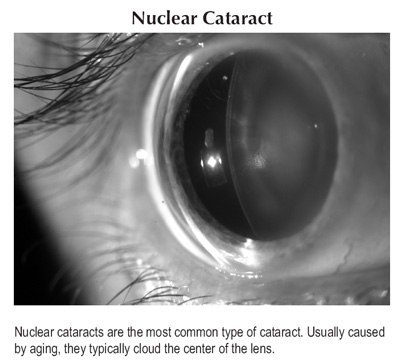 You will usually see cataracts classified according to their location on the lens: nuclear, cortical, or subcapsular. A nuclear cataract is the most common and is the type most associated with aging, although older patients often have more than one type. A nuclear cataract, as the name suggests, is a clouding of the center of the lens, almost always due to aging. One of the early symptoms, oddly enough, is that your near vision will improve for a while. This improvement, referred to as second sight, is short-lived, however. As the cataract advances, the lens becomes yellow or even brown. Vision becomes dimmer and blurrier, and you're likely to have trouble distinguishing colors. Glare might bother you, making it hard to drive at night. You may need stronger light for pursuits such as reading and needlework. Many people develop cortical cataracts with age. 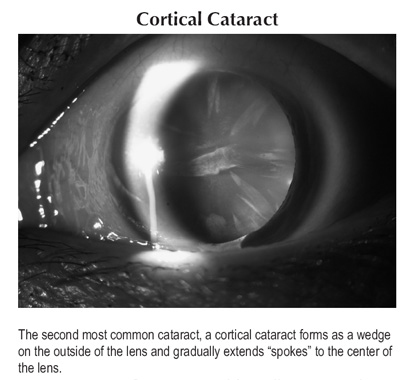 These cataracts begin as whitish, wedge-shaped opaque areas on the outer edge of the lens cortex, near the capsule. Slowly, these opacities become streaks reaching inward to the center of the lens, like spokes on a wheel. When they reach the center, they block part of the light passing through the nucleus of the lens, and you will begin to have problems with focusing, distortion, and glare. Because both distance and near vision are impaired, you may require surgery at a comparatively early stage. If you have diabetes, you may be particularly susceptible to cortical cataracts. When a subcapsular cataract begins at the back of the lens, which is most often the case, it's called a posterior subcapsular cataract. It starts out as a grainlike opaque area under the lens capsule. 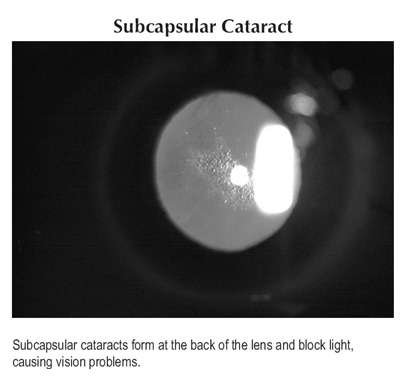 Because posterior subcapsular cataracts are usually directly in the path of light on its way to the retina, you might have vision problems early on, particularly with glare and halos. Anyone can have subcapsular cataracts in one or both eyes. People who are extremely nearsighted, who have diabetes, or who are taking high doses of steroids are particularly at risk.